See "Getting Started:Building Models" for more details about the DC motor model. 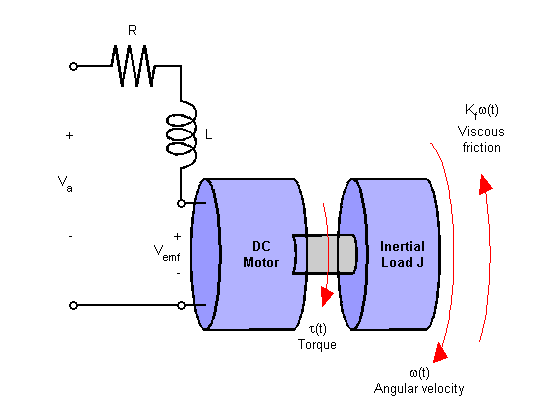 In armature-controlled DC motors, the applied voltage Va controls the angular velocity w of the shaft. 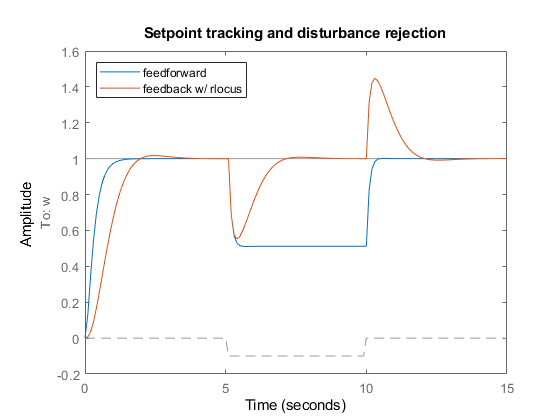 This example shows two DC motor control techniques for reducing the sensitivity of w to load variations (changes in the torque opposed by the motor load). A simplified model of the DC motor is shown above. 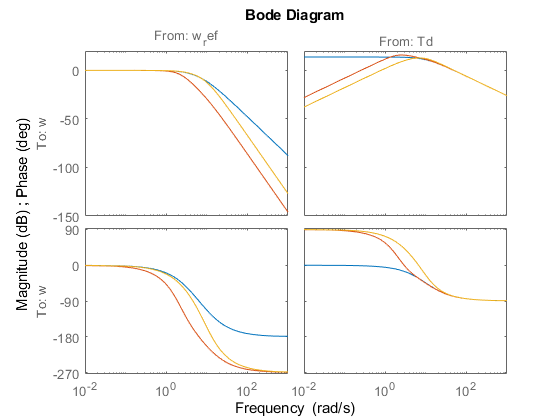 The torque Td models load disturbances. 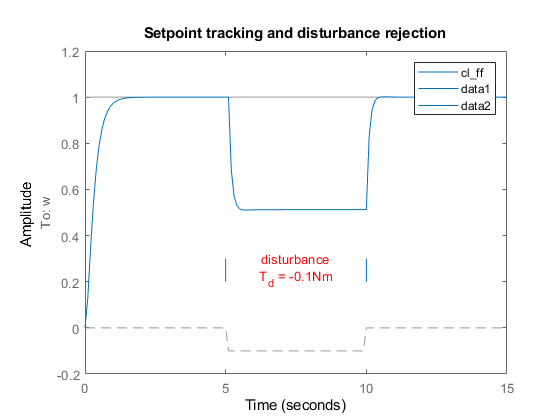 You must minimize the speed variations induced by such disturbances. Note: Compute with the state-space form to minimize the model order. 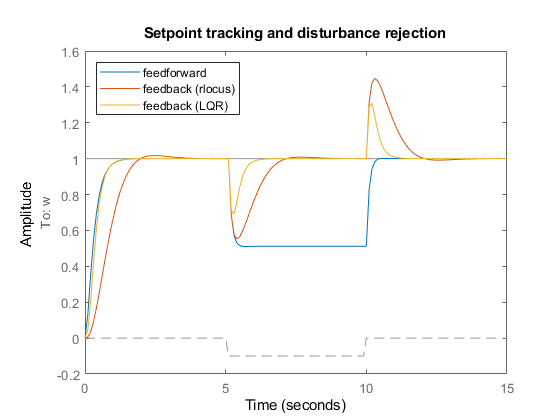 Right-click on the plot and select "Characteristics:Settling Time" to display the settling time. 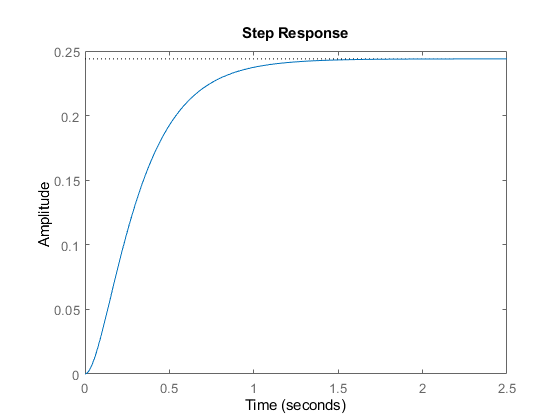 You can use this simple feedforward control structure to command the angular velocity w to a given value w_ref. 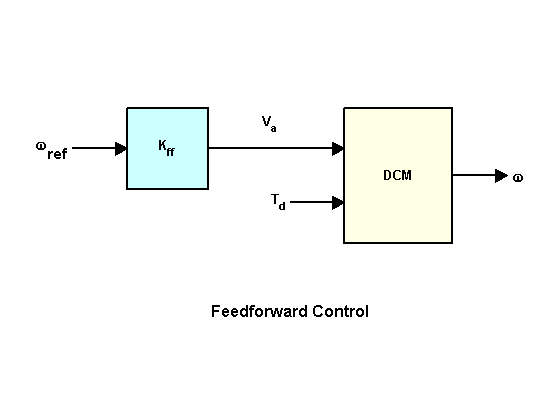 The feedforward gain Kff should be set to the reciprocal of the DC gain from Va to w.
Clearly feedforward control handles load disturbances poorly. 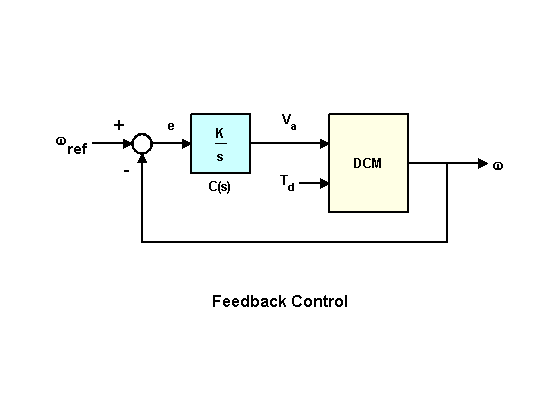 Next try the feedback control structure shown below. where K is to be determined. Click on the curves to read the gain values and related info. A reasonable choice here is K = 5. Note that the SISO Design Tool offers an integrated GUI to perform such designs (help sisotool for details). 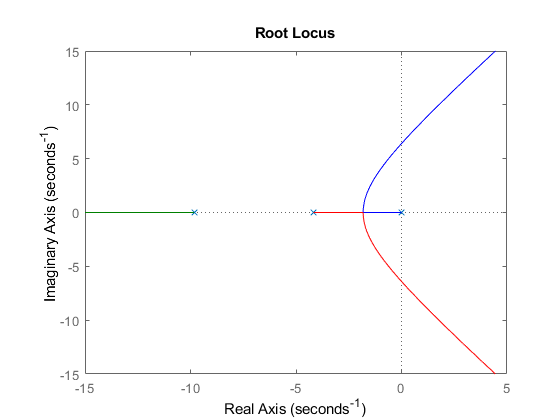 The root locus design is better at rejecting load disturbances. 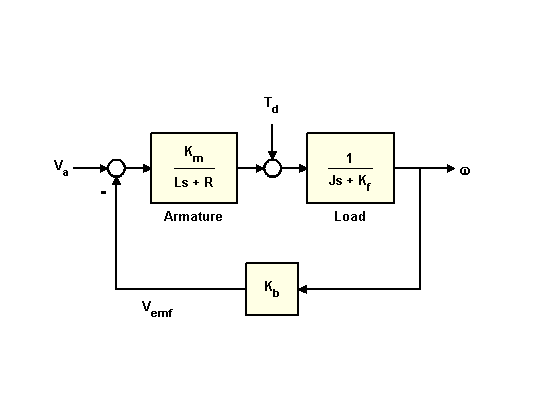 To further improve performance, try designing a linear quadratic regulator (LQR) for the feedback structure shown below. where i is the armature current. 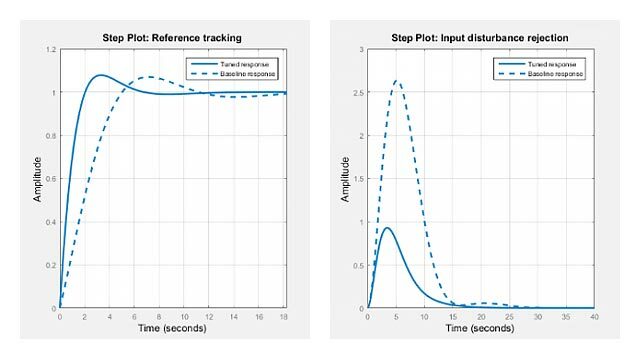 Click on the curves to identify the systems or inspect the data. 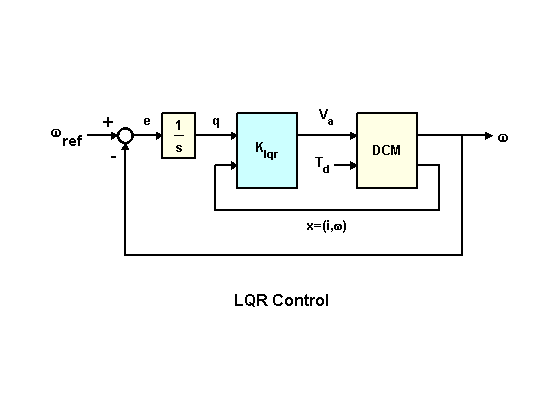 Thanks to its additional degrees of freedom, the LQR compensator performs best at rejecting load disturbances (among the three DC motor control designs discussed here).